In Iraq ten years ago, Nubs and Major Brian Dennis met on the field and became great friends. 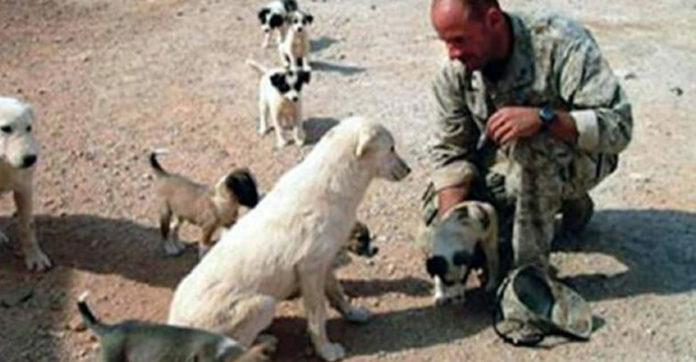 Brian stated that most of the stray dogs were like unofficial guard dogs around their military border fort. Nubs was one of those dogs. When Dennis had to be transferred to a new fort which was 75 miles away, he had to bid farewell to Nubs. However, Nubs chased after the convoy Brian was in. A few days after Brian had left for the new fort, he was informed that he had a visitor, who was none other than Nubs! Although the Marines were not permitted to keep pets, a doghouse was built for Nubs. Sadly, the commanding officer did not allow it. Brian, who refused to part with Nubs once again, decided to raise enough money to ship Nubs to the United States. Now, these two best friends have been inseparable since.